Old art, New art, and an attempt at Virmir I couldn't get past the head on. Sorry some are sideways, took them with a Kindle. I feel like I'm the only one here who couldn't do an animal in any possible way if I tried, except for as a Minecraft skin, Since that's about 90% of these... And now I need to make Virmir as a Minecraft character, with the right ratio and all that to test that "theory". Give me five minutes. Well nice blocky characters, none-the-less. I approve of the Virmir attempt! Thanks, means a lot! If you want I can make one for you. I do them for fun, so if you want me to make you one, just give me a reference sheet and a pose description and I should be able to do it for you. By the way, Your reply have me about a 1 quadrillion percent self esteem boost. Cosmic: (thinking) I'm the only non cartoony animal here , even if I'm not human. That's different. Virmir: So what are we looking for again? Cosmic: A crystal. It's light blue, but there are more colors swirling around inside, kind of like opal. Virmir: So a rainbow gem. And you say this blasted rock will give you the power to "bend space and time" and "destroy evil?" Virmir: Trees. I can't even tell if you're lying. Next two pieces: digital Virmirs because it's challenging and I need to improve. Looking good with the Virmirs! So, I've been working on my Fursona lately since I hadn't finished it up, and here it is! He's a tiger who goes either by Ty (yes, unoriginal, I know, but I like the name Tyler and the nickname seems fitting) or Cosmic, as they are both the one in the same: me. He is 6' 1" excluding the ears, and he shares the same backstory as Cosmic Crafter. Other than appearance, Cosmic Crafter and Ty are exactly the same. Same personality, likes, dislikes, and weopon preferences. Okay, that last part was unnecessary, but I'm always an all-around swordsman and I just think that it's an interesting fact to point out. Edit: Why are these always sideways? The other day in the chat, I sorta became a toonified version of Ty, since I wasn't already one in that (or any!) form. 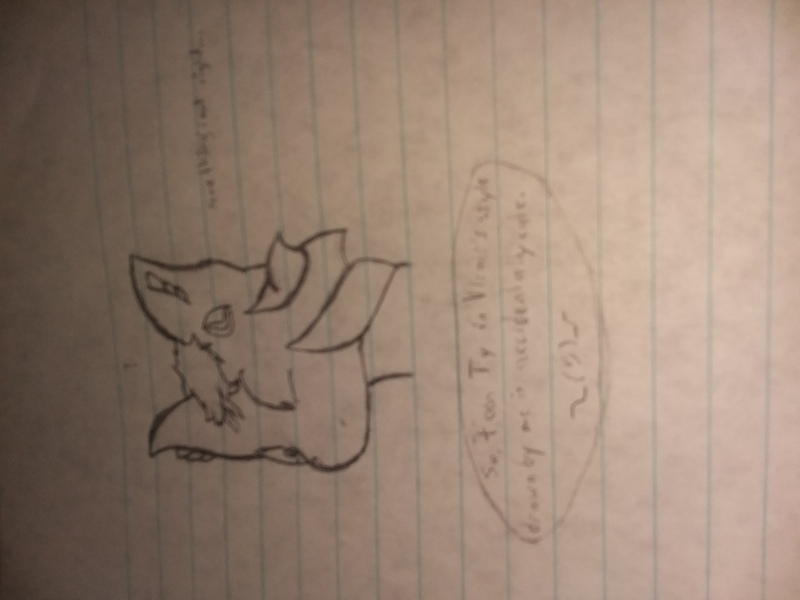 Therefore, I had to draw it, but because I have no clue how to draw toons, I tried ro copy Virmir's style a bit for a sketch, and I accidentally made him look cute. (21:58:52) Virmir: What did you say? I like it! In my experience, Virmir's style is often good for inspiration, and then some of that carries over to your style! Then all of a sudden you've developed your own style for comic characters! Is this part of your official Ty reference? Thanks guys! I'm probably going to color this, but it's (sadly) not going to become part of the main reference. Maybe a little side ref, though. That'll work.